The topic of cancer and life insurance is not an easy one. Cancer is a disease that falls into the category of critical illness, so all insurers treat it as a higher risk. If you were diagnosed with cancer or you are a cancer survivor, getting a life insurance quote and buying a life insurance policy is not as straight-forward as it would be for people with manageable diabetes. In this article we will highlight the options that are available to you, and also provide examples of life insurance quotes for people with cancer. First, you need to know that there are over hundred different types of cancer, and some are far more serious than others. Here is an overview of seven of the most frequent types of cancer in Canada for each gender, according to the Statistics Canada. No reoccurrence: If you have not been diagnosed with reoccurring cancer, you pose less risk from an insurance perspective. Date of diagnosis: The further back the date of diagnosis, the more stable your situation appears to an insurer (if your situation is stable and is not deteriorating). Less serious forms of cancer: Every type of cancer is bad and can be very dangerous. Some of them, though, can be treated with more success than others, especially in the very initial stages, such as melanoma (skin cancer). It is important to understand that with cancer, you often have an option between choosing rated traditional life insurance (less serious cases) or no medical life insurance (for more serious cases). No medical insurance does not require medical exam and, sometimes, does not even require answering a medical questionnaire. When assessing rates we will be looking at three options: people with less threatening cancer pre-conditions, average cancer pre-conditions and serious cancer preconditions. 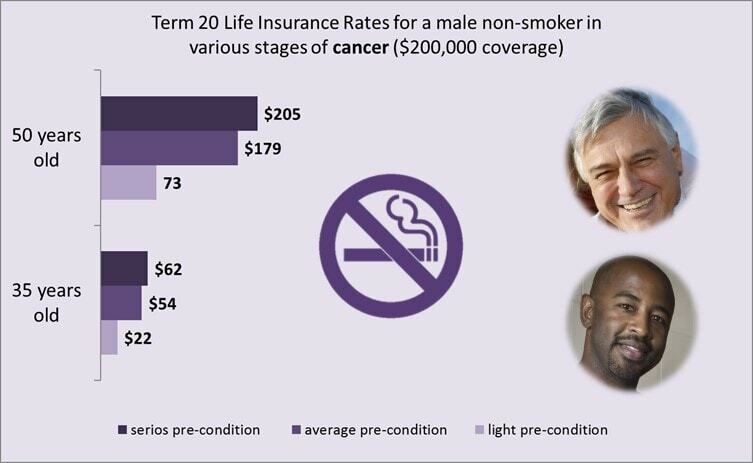 If you are considering Term 20 life insurance with coverage of $200,000, rates for a male aged 35 years may vary between $22 and $62 per month. Average severity of your cancer pre-condition means monthly rates of $54. Should you be 50 years old, your rates will likely vary between $73 and $205, with an average level of rates for an average cancer pre-condition at $179/month. Women typically pay 10%-20% less for their life insurance policies – it is based on longer average female longevity. If you are considering the same Term 20 life insurance policy with coverage of $200,000, rates for a female aged 35 years old may vary between $18 and $49 per month. Average severity of your cancer pre-condition means monthly rates of $43. If you are 50 years old, your rates will likely vary between $52 and $146 with an average level of rates for an average cancer pre-condition at $127/month. Smoking increases your rates by double or more. Smoking automatically creates a much higher risk for insurers who “reward” this habit with higher premiums. 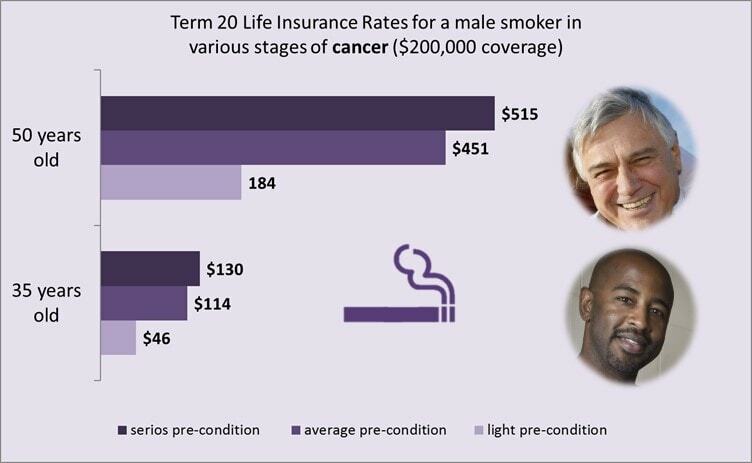 If you smoke and are considering a Term 20 life insurance policy with coverage of $200,000, rates for a male aged 35 years old may vary between $46 and $130 per month. Average severity of your cancer pre-condition means monthly rates of $114. Should you be 50 years old and smoke, your rates will likely vary between $184 and $515 with an average level of rates for an average cancer precondition at $451/month. 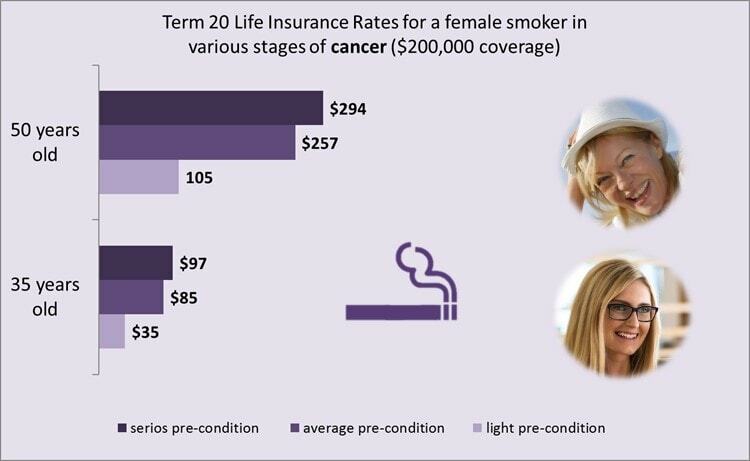 Despite lower premiums that women pay when compared to men, smoking still significantly drives up life insurance rates for women. Let us look at the rates below. 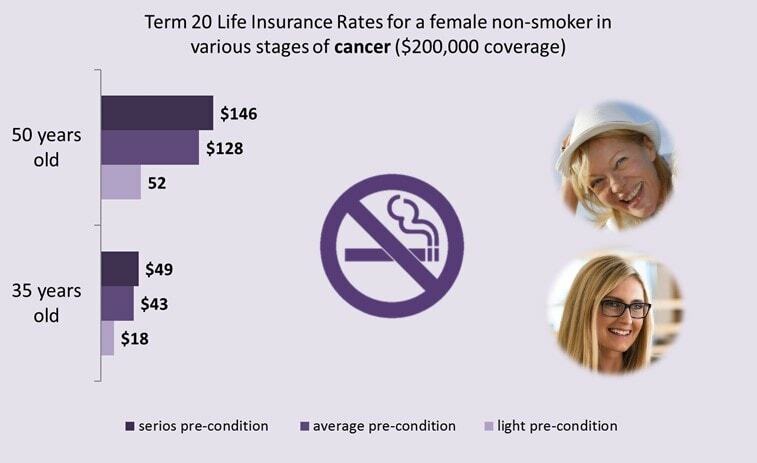 If you are female, smoke and are considering purchasing a Term 20 life insurance policy with coverage of $200,000, rates for those aged 35 years old may vary between $34 and $97 per month. Average severity of your cancer pre-condition means monthly rates of $85. If you are a female, 50 years old and smoke, your rates will vary between $105 and $294 with an average level of rates for average cancer precondition at $258/month. Simplified issue no medical life insurance comes without medical exams but still can have some questions that you need to answer (and you need to reply to these truthfully). An experienced insurance broker can navigate you to the companies that have less cancer-related insurance questions. For example, this question from Assumption Life: “Have you been declined for life insurance in the last two years,” can get you denied for this policy if you have been declined for any other life insurance policy. Simplified issue life insurance offers premiums lower than guaranteed life insurance and higher levels of coverage. Guaranteed issue no medical life insurance comes without any medical exams and without any medical questions. That comes at a cost – a guaranteed issue life insurance quote will be more expensive than any other life insurance quote for a similar coverage. You also need to know that no medical life insurance policies do not offer as much coverage as traditional life insurance. They also have a two-year benefit waiting period (applicable to all guaranteed issue policies and some simplified issue policies) meaning that if a policyholder dies within the first two years, and the death is from disease and not from an accident, the claim will not be paid and only the premiums will be returned. There are several ways how you can get life insurance if you have cancer: through an insurance agent, insurance broker or directly by calling an insurance company (via a call centre). The best way to go is though an insurance broker because he/she can help you with getting the best life insurance quote for people with cancer and navigating through the details of fine print. Many insurers treat insurance cases differently and you need somebody to help you make an informed decision. ‹ What Alternative Life Insurance Options Have People With Diseases?